Hello, we hope you enjoyed your break! We are back with our newsletter, covering the latest about data science and AI in London and beyond. Over the last few days, the world’s Go champion (defeated by AlphaGo in 2017) announced new AI matches, and UK machine intelligence startup ProFinda raised £4.8 million. Also, Chinese tech giant Baidu sued a former executive for allegedly stealing trade secrets about driverless technology, and using them to launch a rival venture. Beijing-based Baidu— a major AI player, often compared to Google—launched the RMB 50 million (£5.6 million) lawsuit against its former senior vice-president Wang Jin, who recently founded driverless vehicle startup JingChi. Ke Jie, the Go champion who pledged never to challenge an Artificial Intelligence again after being trounced by DeepMind’s AlphaGo, is going to play against a machine once more. Ke will take on a number of Go-playing AIs in April 2018, during the World AI Go Tournament in China. London-based AI startup ProFinda secured £4.8 million from investors including Notion Capital and Nextlaw Ventures. The startup uses machine intelligence to analyse companies’ workforce and highlight each employee’s skills, connections, and behaviours. Let’s take stock of 2017, and try to work out how much investment Britain’s data science and Artificial Intelligence companies attracted over the last twelve months. How AI Could Revolutionise Coffee! 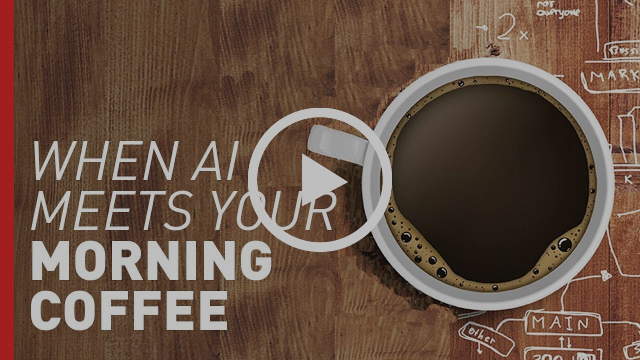 Let’s start the new year with a caffeine shot: watch how AI could change the way we enjoy our espresso.